The floor lamp for UV Compact Lamps with an E27 Fitting, qualified for all species of birds is fully flexible and easily adjustable in various positions. The compact lamp is not included in the scope of delivery. The normal UV Lamps like Birdlamp, which usually are to be fixed with clips on the grid, are not as easy to handle as the AvianSun Lamp. Because of its elegant design, the floor lamp can be placed next to the cage so that the angels formed by the UV light sources rays achieve the optimal results. The advantage is that the connecting cable is on the outside of the cage situated, so that the birds can't nibble it. Another highlight is in the lampshade integrated reflector, which ensures the maximal light and UV radiation. 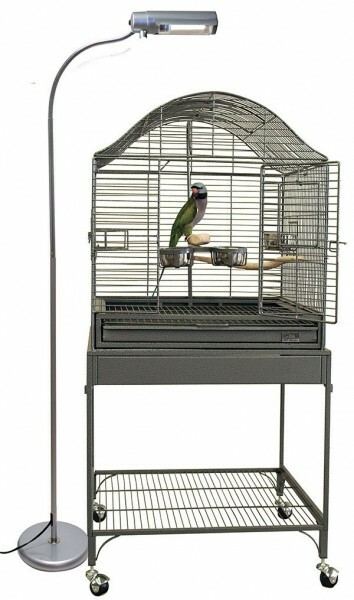 The floor lamp and therewith the light source can be horizontally or vertically diversified positioned depending on the cage size and the bird's preferences. The lamp should be placed over the bird's head, so that a direct eye contact is avoided. links "AvianSun Deluxe Floor Lamp"
customer reviews on "AvianSun Deluxe Floor Lamp"
Lampe wird täglich verwendet. Höhe optimal über Vogelkäfig. Verarbeitung ist allerdings recht billig. Versand war sehr schnell. 2 Tage zuvor bestellt. Lampe ist leider billig verarbeitet. Wird täglich verwendet. Wenn man den richtigen Winkel und die höhe der Lampe hat, ist auch der Schwanenhals stabil. Meine Blaugenicks freuen sich über das zusätzliche Licht in den Wintermonaten. Super Beratung der Mitarbeiter. Die Lampe war im Aufbau schnell und unkompliziert, das Design wirkt Modern. Jedeglich der Lampenschirm und die verschiedenen Materialen der Stange wirken recht billig verarbeitet. Die Lampe erfüllt ihren Zweck und meine Wellis haben sie nach kurzer skepsis gut angenommen.